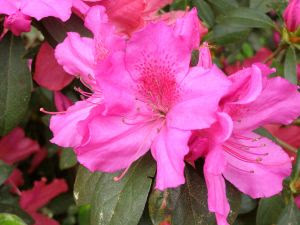 As azaleas get ready to take center stage, cherry blossoms are making their final bows. I marvel at how the Lord timed the appearance of each flower, giving us a continual parade of stunning blooms. In my Internet travels, I came across an article on self-editing at the Edit Cafe. Are you too close to your work? I'm reminded of old movies where an artist would step back from his canvas and frame the picture with his hands. The writer benefits from putting aside a manuscript and then coming back with fresh eyes. Over at C. J. Darlington's blog, Publicist Deonne Beron gives authors advice on promoting their books. A friend of mine recently asked what were my favorite writing tools. This post reminded me of her query. 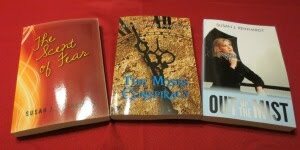 Author Kaye Dacus shares some of her essentials with pictures. Have a happy, spring weekend! It's summer here!! Almost 90 yesterday. ANd yes-- I get too close to my editing and have to put it aside to see the errors. I am going to follow these links! Thanks. Have a blessed weekend! I def. get too close to my work. Right now I'm about to send a writer friend the first half so she can give me some advice. She's not my crit partner but I really trust her (plus she's an amazing writer). I think it's important to have someone, not just a crit partner, who can look at the big picture of your book and pinpoint things in an objective way. I hope you find them helpful. Enjoy your weekend. We're supposed to hit 90 this weekend. I don't want to give up spring yet. It's too soon. Susan: I not only get too close to my work, i get sick of it. I have to take a break sometimes or go nutso! Prayer and chocolate help, too. I also need to pray for a crit partner. I'm sure that would help. In my writing group we read aloud what we have done with our weekly topic. When we have a critique, the person reads aloud and catches the omitted words, and the mispellings,the quotes without the closing marks. With the newsletters I do, I have one from the ministry read over them. It always is good to have an extra pair of eyes. Our writers group meets twice a month. Your group's practice of a weekly writing topic might be something we could try. I guess it's like a writing prompt. I'm always surprised at how many things the group catches. If they think something is vague or confusing, then other folks will as well. Oh my, I know what you mean. After editing my book for the umpteenth time, I'm ready to declare it, "finished." Alas, it isn't. LOL! If you have another giveaway, let me know in advance, and I'll get it in the Friday Round-Up. I do these posts ahead of time and schedule them. "The writer benefits from putting aside a manuscript and then coming back with fresh eyes." I agree. And it's so refreshing to find mistakes you never would have found before! Welcome to my blog! I post here Mondays, Wednesdays, and Fridays. I'd rather find my mistakes than have an editor pick them up or a reader. Thanks for your comment.